Based in Everett, Wash., BLR Aerospace specializes in aerodynamic performance enhancements for helicopters and turbine-powered aircraft. These exterior modifications include proprietary winglet systems, dual tailboom strakes, vortex generators and its FastFin® tail-rotor enhancement and stability systems. 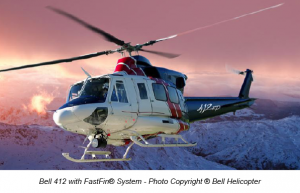 They are sold to industry-leading OEMs, notably Beechcraft Corporation and Bell Helicopter, where they’ve become standard on helicopters and airplanes. 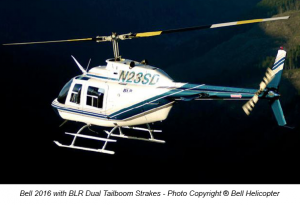 BLR’s products are also sold in the aftermarket for retrofitting a range of aircraft. The 24-year-old company’s performance-enhancing technologies enable operators to fly higher, faster and farther, as well as more efficiently and safely. A developer of patented technology, BLR is innovation-focused and market-driven. It identifies needs and niche opportunities, then designs and manufactures products to fulfill them. Currently, its emphasis is on bringing new helicopter products to market. BLR Aerospace is continually developing new aerodynamic cowlings it can bring to market quickly and profitably. This necessitates ongoing research and development – including multiple iterations of composite parts to ensure they fit precise specifications and perform as intended. The company required a stable, easily machined tooling material for prototyping composite parts, specifically large-scale, true-to-life carbon fiber and fiberglass parts. Their design engineers sought an affordable alternative to more permanent tooling to allow for various design iterations, while factoring cost and time requirements. Previously, the company used metallic tools, which were time-consuming to produce and expensive. They wanted a material that was not so heavy and cumbersome to handle when laying up parts, and that would cost less to ship to their manufacturing facilities across Washington and Oregon. One of the other materials BLR experimented with was medium-density fiberboard (MDF), which is relatively cheap and machinable. However, in use it fell short in one key thermal property: temperature stability at a minimum 250 degrees Fahrenheit. A wood-based product, the MDF tool had wild variances in tolerances, creating a lot of distortion. The resulting parts had unpredictable dimensions as well as waves and warping within the part. After the MDF tool proved unacceptable, BLR zeroed in on General Plastics and our LAST-A-FOAM® FR-4700 High-Temperature Tooling series. According to lead project engineer Russell Bezzo, preference for General Plastics’ products within the aerospace industry drove them to investigate our materials. They determined that the FR-4700 met their specific needs, and primarily use the 30-pound material as tooling for prototyping parts that become their aerodynamic fairings. “Machining tools using this foam allows us to lay up the carbon-fiber and composite parts, put them in the oven and make true-to-life prototypes using the actual materials that we’ll use in production,” Bezzo said. He explains that the FR-4700 maintains the required properties, remaining very stable and uniform when it expands and contracts during the curing cycle. The foam provides excellent machinability and allows for tight tolerances, necessary in the world of prototyping. Moreover, the lower-weight tools are less cumbersome to handle when making prototypes and cost less to ship to their composite manufacturing facilities. As a result, BLR can make a single, life-size composite part and determine if it will fit or satisfy the specific need, at a substantially lower cost and in significantly less time. This is far more economical than machining large pieces of metal for a prototype tool that is used only once, ultimately wasting tens of thousands of dollars. The entire process is controlled within one facility. It expedites the timeline by cutting out the middleman. BLR doesn’t have to ship huge foam blocks to a separate shop to be machined and then ship the machined tools to another to build its parts. The experts who produce the foam know the materials and how to machine it best – what kind of bits and which feed rates to use, eliminating the guesswork. Overall, relying on General Plastics for both its high-temperature tooling foam and CNC machining capabilities has allowed BLR to maintain a short timeline and cost targets. They have been able to achieve tighter tolerances with their prototype FR-4700 tools. Additionally, BLR can use the actual production material instead of a prototype material, resulting in highly accurate, true-to-life prototypes for testing and installation on aircraft. A shorter turnaround for tools means faster design and prototype iterations, compressing research and development time. The upshot for this aerospace innovator? It gets new products to market faster and with greater cost efficiencies for a bigger business lift. So, with the performance enhancements provided by General Plastics, BLR Aerospace can fly higher, faster and farther.